It’s time for another in our series of pub-nights this year! It will happen on Friday November 4th at 7:00 PM. Just in time to help you recover from Halloween. 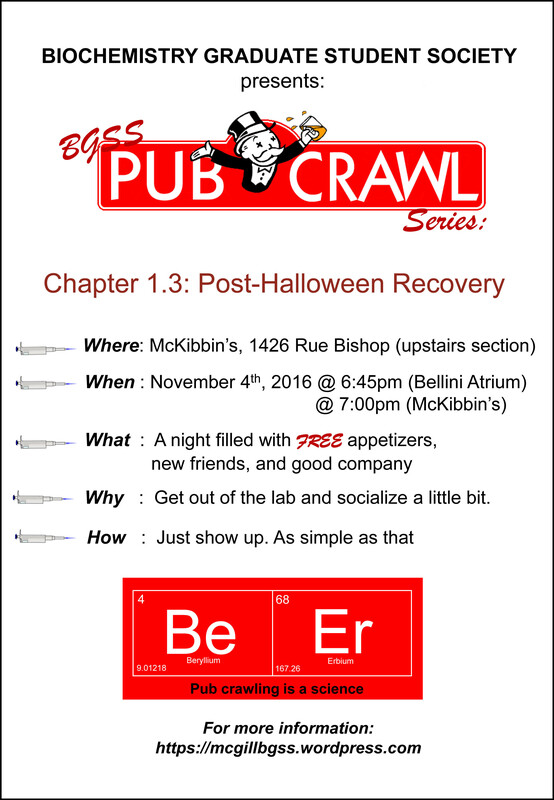 This time we will going to McKibbin’s on Bishop Street. You can meet us at 6:45 PM on the Bellini atrium to walk there together, or at the pub after 7:00 PM. As usual we will offering free appetizers. Posted in Uncategorized on October 25, 2016 by mcgillbgss. The McGill Undergraduate Biochemistry Society (BUGS) invites you to participate in this year’s Research Awareness Day (RAD) on Saturday Nov 19th! Well, RAD is an annual event seeking to connect undergraduate students with Biochem research being conducted at McGill, through mini-presentations by professors and roundtable discussions. This year, we’re very excited to expand on the day by having graduate students engage in a Poster Fair and Wine & Cheese, running from 2:30-4PM! During this time, undergraduate students will be filtering through to ask questions about your research and your personal experience working in a biochem lab. Well we definitely recognize there are many poster fairs already happening this semester and we encourage you to simply re-use a previously made poster. However, the RAD poster fair concept is different from the traditional poster fair. You will not be judged, instead you will have time to casually talk about your research and give back to the undergraduate community over wine and cheese. Oh come on, it will be fun! A chance to practice clear communication of science, engage with undergraduates, talk about your personal research experience, win a fantastic raffle prize, and free Wine & Cheese- what could be better? Fill out this form (https://goo.gl/forms/nz64abBY3ldjMWDf1) by November 7th the latest! Don’t forget, the Poster Fair and Wine & Cheese will run from 2:30pm-4pm on Saturday Nov 19th, and we need you there the full time! Now that September is over, classes have started and we’ve all settled back into our routine, it’s time to turn our attention to our favourite pass time – HOCKEY! 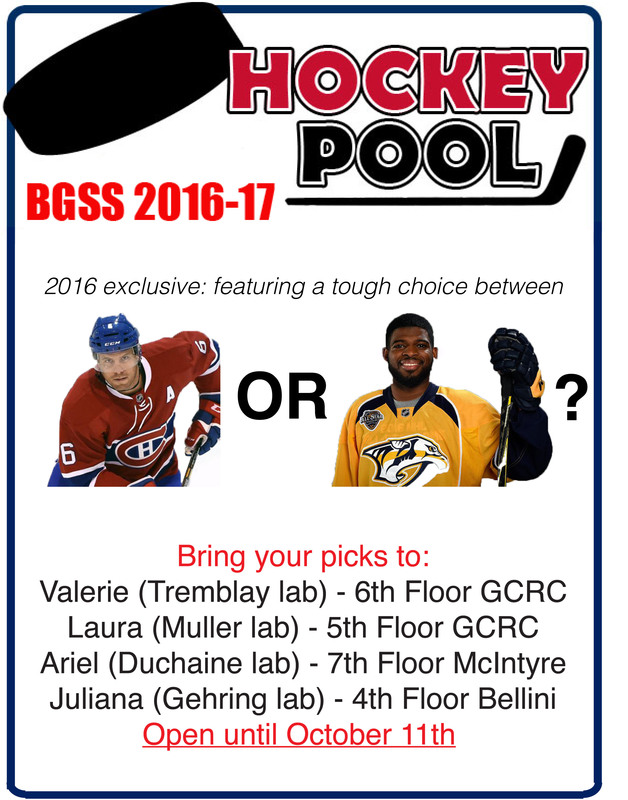 1) After the success of last year’s pool, BGSS will again be running a season long NHL hockey pool! Registration is open until midnight Tuesday October 11th 2016 (season starts on October 12th). Participation is 5$, and those with the highest amount of points at the end of the season win money! As an added bonus, the participant with the least amount of points will get their participation reimbursed. Please see form for rules and instructions on how to join the pool. Good luck! 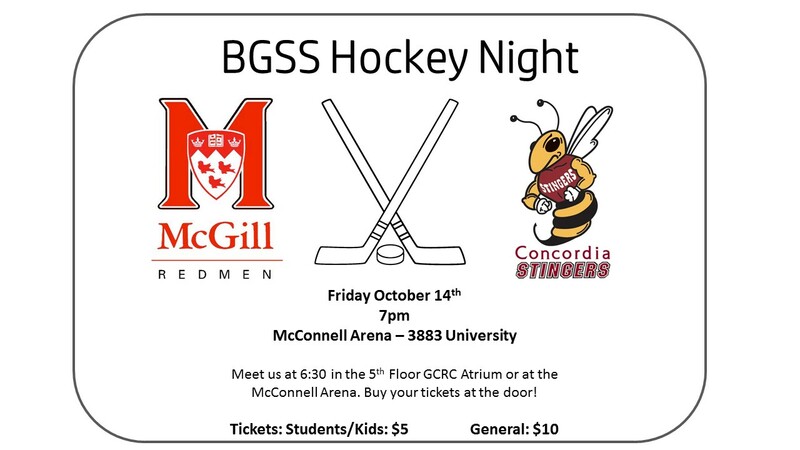 2) Additionally, get ready to show your McGill pride and join us at the much anticipated McGill Redmen vs Concordia Stingers game Oct 14th at 7pm. Tickets are only $5 with your McGill ID (Beer is available for $6!). Meet us in the GCRC 5th Floor atrium at 6:30 to walk over together or just meet us at the McGill McConnell Arena. Tickets will be bought at the door. Looking forward to seeing you all there! Posted in Uncategorized on October 3, 2016 by mcgillbgss.